It’s Not Too Late To NAMA-nate! The deadline for NAMA-nating your peers for the Professional Development Awards of Excellence has been extended to Sept. 11! You’ve done a lot of hard work and now it’s time for it to pay off. Submit your best work in the Best of NAMA competition. The Best of NAMA Call for Entries is available on-line now. The deadline for submitting your entries is Friday, October 16. 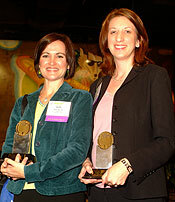 The Best of NAMA awards program honors the best work in agricultural communications. Actually, the best of the best, since companies/agencies must first qualify through regional competition in order to advance to the national level. The national awards ceremony will take place April 21, at the Hyatt Regency Crown Center, Kansas City. Best of NAMA operates on a regional judging format. Entries are sent directly to the national NAMA office and judged by industry professionals at a regional level for possible advancement to national competition. A minimum point standard will be used and enforced at the regional level. Work that is not above a certain point standard will not be eligible to advance. The regional Best of NAMA judging will take place November 9-10, prior to the fall Trends In Agriculture meeting, November 10-11. If you place first or merit at the regional competition and score above the minimum point standard, you are eligible to advance to the national competition. The NAMA office will notify you by February 1, 2010 regarding entries eligible for advancement. Join us at 1:00 p.m. (Central Time) on September 17 for the next NAMA Webinar, How What You Think You Know Could Be Hurting Your Business – Overcoming the Limitations of “First-hand” Knowledge With Personas. If you don’t have time to attend a chapter or national meeting, stay connected with your NAMA peers at a NAMA Webinar – you won’t even have to leave your office! Each of us, while well intentioned, often uses a very different customer as the frame of reference to make product development and marketing decisions for today’s agricultural producer. Popularized by Alan Cooper in his 1999 book The Inmates are Running the Asylum, personas are fictitious characters created to represent the different user types within a given demographic. To register for the NAMA Webinar visit http://www.nama.org/ConferenceRegistration/Default.aspx?confid=4 or call 913-491-6500. A Free Gift From NAMA! We’ve got a special gift for you! As a special member benefit, we audio recorded the Social Media & Southwest Airlines session, presented by Christi Day of Southwest Airlines, from the recent NAMA Boot Camp. You can download the audio presentation in an MP3 format at http://www.nama.org/Southwest4.mp3 and download the powerpoint slides in an Adobe .PDF format at http://www.nama.org/southwest.pdf. Both are large files and may take a few minutes to download. Some of the questions asked by audience members during the presentation may be hard to hear, but we did try to bring up the volume as much as possible. We hope you enjoy this special presentation! See What Members Are Saying About NAMA! We are just getting the ExploreNAMA channel underway and have some great video clips. See what Nancy Gill, Superior Productions, had to say about the networking opportunities at the NAMA Boot Camp. Coming up on the ExploreNAMA channel will be clips from meetings, the Student Marketing Competition at the conference, etc. So sign up with YouTube and subscribe to the ExploreNAMA channel! You’ve joined us on Facebook and Twitter, now tune in to the ExploreNAMA channel on YouTube. At the end of the busiest day at the Farm Progress Show in Decatur, Illinois, it was nice to get out of the sun on Wednesday, Sept. 2 and share complimentary drinks and hors d’oeuvres with both NAMA members and non-members. The Heartland Chapter’s invitation to gather in the Exhibitor’s tent at the Farm Progress Show was a big success with over 40 people in attendance. Attendees were able to sit down and relax while networking and sharing stories from the Show. Professionals from several chapters were there, in addition to future student members who are in the process of starting a new NAMA student chapter. Two seconds. That’s how long it takes for us to make a first impression. Attendees at the opening session of the 2009 NAMA Boot Camp listened intently as Dr. Jennifer K. Martin, Hall Family Foundation Professor, University of Missouri-Kansas City, shared tips to help them master body language and become more effective public speakers. Earlier in the day, Boot Camp started bright and early with the traditional MoKan Ag Tour. It was obvious Boot Camp made an excellent first impression on the agri-marketing professionals who loved the networking and the candid panel sessions. (Or maybe they loved the keepsake pork chops they got on the Ag Tour. Yes. Every person really took home a pork chop.) Most likely, it was the face-to-face contact with thoughtful representatives of their key end markets. Panelists mingled with attendees in between sessions and attended the social hour hosted at Kansas City’s famous Boulevard Brewing Company. One-on-one Q&A sessions and invaluable opportunities to hear feedback “straight from the horse’s mouth” were high on the list of valuable take-aways from Boot Camp. Sessions on social marketing, pitching to the ag media and client management rounded out the breakout sessions. NAMA makes sure every effort is made to cater to the needs of each niche in the agri-marketing universe. on Jedi Marketing. Inspirational, reassuring and hilarious—the perfect end to the NAMA Boot Camp.